This profile requires using the Active Thumb Stick Swap function. 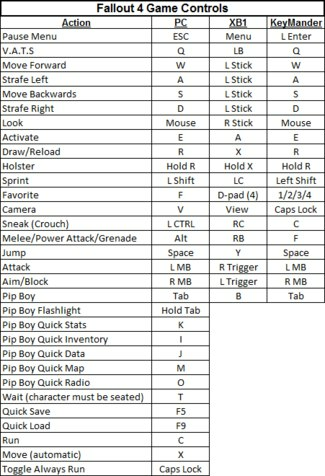 Pressing and holding Q swaps movement from the keyboard to the mouse (and vice versa) for better integration with VATS, lock picking, and navigation on the PIP Boy map. The attached profile features key bindings similar to the PC version, with a couple exceptions as noted in the chart below. 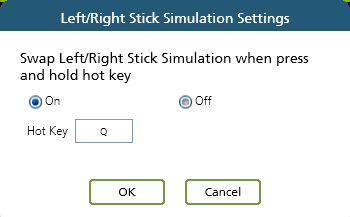 If you rebind the keys, make sure you map the Active Thumb Stick Swap function to the same key you map for the VATS function. NOTE: The Active Thumb Stick Swap function requires KeyMander software V1.2.116 and firmware v1.2.119.002 or newer. Thanks you for sharing the profile. I'm going to use it and return here with results!! The secondary profile for lock picking and Pip-boy is a workaround for now. We are working on incorporating secondary functions and a "level shift" feature that would allow the same functionality with just a single profile. I use the primary profile in the F1 slot and the lock pick profile in slot F2 just to make it easier to remember, and it seems to work well. Haven't checked yet switching between profiles for lockpicking. I had originally uploaded the profile with nearly stock key bindings, but Bethesda didn't do a good job of optimizing the functions to the XB1 controller, so it feels very odd. I have now uploaded the profile group with the key bindings I personally use, which are based on a Call of Duty layout since it has become a common configuration for many games (muscle memory). However, if you came from Fallout on a PC you will definitely want to rebind the keys to match what you're used to using. I've attached a simple chart below showing the Fallout 4 controls on PC, stock XB1 controller, and the updated sample profile I uploaded for KeyMander. Hopefully this helps!